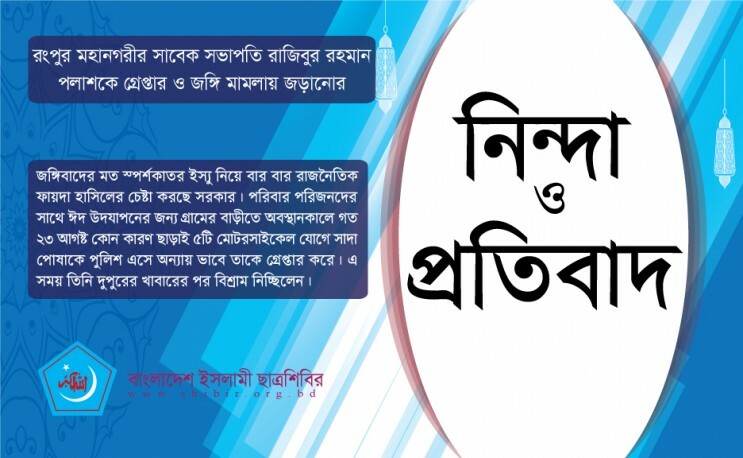 In a joint statement, Shibir Central President Yasin Arafat and Secretary General Mobarak Hossain said that the government is trying to achieve political benefits using sensitive issues like militancy,and police are helping them in legal and illegal aspects. While staying at the village house for celebrating the Eid with family members, on August 23, a group of plain clothes police in 5 motorcycles arrested him unjustly. During this time, he was resting after lunch. However, the police falsely mentioned in the remand application that he was arrested from the mosque during the planning of sabotage activities for political purposes. At the same time, he was shown arrested in a militant case. He was shown possessing cocktails, rods, bamboo sticks. He has been remanded and tortured. These irresponsible activities of the police are simply acts of political revenge. There is no question of him having any relation with militancy. There is no relation between militancy and Chhatra Shibir and that has proven worldwide. Yet, by misusing the militant issue, the government has made the conspiracy to try to politically damage the image of Shibir. Earlier, in order to implement the government's agenda, some leaders and activists of the Shibir activists were associated by police with false propaganda related to militancy in the country. But all allegations against Shibir activists have been proved false in time. Police and government officials are well aware that there is no relation of Shibir with Islamist militancy. Nevertheless, the people of the country think that this kind of immoral activity is a part of the conspiracy against the Islamic movement. It seems that the government wants to keep the issue of militancy in alive to serve their own purposes. But Chhatra shibir has always opposed militancy and has worked for peaceful politics. The leaders said that the illegal government has taken the country towards such a situation that people can not celebrate the holy Eid in their own house peacefully. Even during the Eid, the oppressive government did not stop the oppression against the people. The leaders said that people have become annoyed and angry with the police for such irresponsible and questionable incidents linked with a sensitive issue like militancy. Such incidents will make the people even more skeptical. We immediately demand the immediate release of Rajibur Rahman Palash and withdrawal of all charges against him. At the same time, we urge the law enforcement agencies to abstain from such hateful activities of making militancy a tool of vendetta in the future.